SpaceX's ambition to develop a reusable rocket took another leap toward reality last week with a record-breaking flight of the Grasshopper testbed, and the company recorded the event from a hexacopter drone hovering over the the company's test facility in Central Texas. The Grasshopper test flight on Oct. 7 reached an altitude of 744 meters, or 2,440 feet, over SpaceX's sprawling test site in McGregor, Texas, before landing back where the rocket took off. SpaceX released video of the 77-second flight on Saturday. A description posted on the company's YouTube account says the single-camera hexacopter got closer to the Grasshopper than on any previous test flight. The Grasshopper is a 10-story test rocket designed to demonstrate SpaceX's concept for recovering used Falcon 9 rocket stages after they complete their jobs during satellite launches. SpaceX says landing and reusing the first stage will reduce the cost of launches. 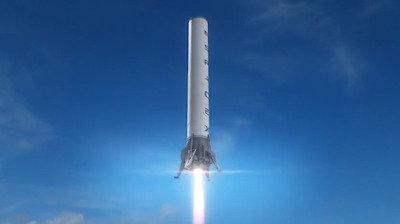 SpaceX plans to affix landing legs to the first stages on future Falcon 9 rockets, beginning as soon as the next resupply flight to the International Space Station set for liftoff in January or February from Cape Canaveral Air Force Station, Fla. The Grasshopper is powered by a single Merlin 1D engine and features four steel and aluminum landing legs with hydraulic dampers and a steel support structure. SpaceX's upgraded Falcon 9 rocket, which launched for the first time Sept. 29, is designed for reusability. Engineers tried to recover the Falcon 9's first stage during the launch from California last month, but SpaceX CEO Elon Musk said the rocket lost control in its roll axis on descent to the Pacific Ocean, causing its engine to prematurely switch off. "We exceeded the roll control authority of the attitude control thrusters," Musk said after the Sept. 29 launch. "In this case, the boost stage did not have landing gear which helps to essentially stabilize the stage like fins on an aircraft." After giving way to the Falcon 9's second stage, the rocket's first stage reignited three of its nine Merlin 1D engines to slow its velocity for the fall back through the dense lower atmosphere. But the first stage's center engine was supposed to fire again as the rocket was on its final descent to the ocean. "The stage actually ended up spinning to a degree that was greater than we could control with the gas thrusters and it centrifuged the propellant," Musk said. "It caused the boost stage to run out of propellant because of the centrifuging effect before hitting the water." Ground crews retrieved fragments of the first stage from the Pacific Ocean a few hundred miles south of the launch site at Vandenberg Air Force Base, Calif.
Musk said the next two Falcon 9 launches, scheduled for November and December with two commercial communications satellites, will not include a recovery attempt. But he expressed confidence of not only recovering a Falcon 9 first stage next year, but performing a complete "flyback" profile of the spent rocket stage with a soft vertical landing on a designated return pad at Cape Canaveral. Such an achievement would be unprecedented in the launch business. "The most important thing is that we now believe we have all the pieces of the puzzle," Musk said Sept. 29. "If you take the Grasshopper tests, where we were able to do a precision takeoff and landing of a Falcon 9 first stage, and you combine it with the results from this flight where we were able to successfully transition from vacuum to hypersonic, through supersonic, through transonic, light the engines all the way through, and control the stage all the way through ... We have all the pieces necessary to achieve a full recovery of the boost stage. We are really excited about that. I think that we will achieve that next year." SpaceX also has plans for a crewed version of its Dragon capsule to make precise rocket-assisted landings at the end of its missions. The cargo version of the spacecraft currently splashes down in the ocean with parachutes.